The U.S. Mint has released its pricing scheme for the three upcoming 2016 Centennial Gold Coins, which will render designs from 1916’s classic circulation coins in gold. 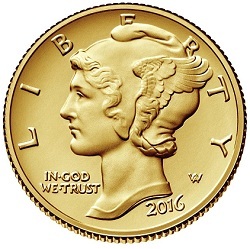 Planned releases include the Winged Liberty (“Mercury”) dime, the Standing Liberty quarter, and the Liberty Walking half dollar; the gold Mercury dime is scheduled for release on Thursday, April 21, but the others still appear as “To be Determined” on the Mint’s product schedule. First-day prices for these issues will not be finalized until closer to their respective launches, as the costs of the Mint’s gold coins are subject to adjustment in accordance with the changing market price of the commodity. The chart below provides pricing for each of the three centennial gold coins based on the value of an ounce of gold, with current prices appearing in bold. For more information on the 2016 Centennial Gold Mercury Dime, please visit the U.S. Mint’s Web site. Just general question. How can the new gold mercury dimes be slabbed and graded sp70 when some of the ones graded are showing up with bent edges. Charles McKee – I haven’t seen any that have bent edges that have been graded SP 70! Would like to see one if you know where I can find one? Mine graded out as a SP69 but it’s still a gorgeous coin.